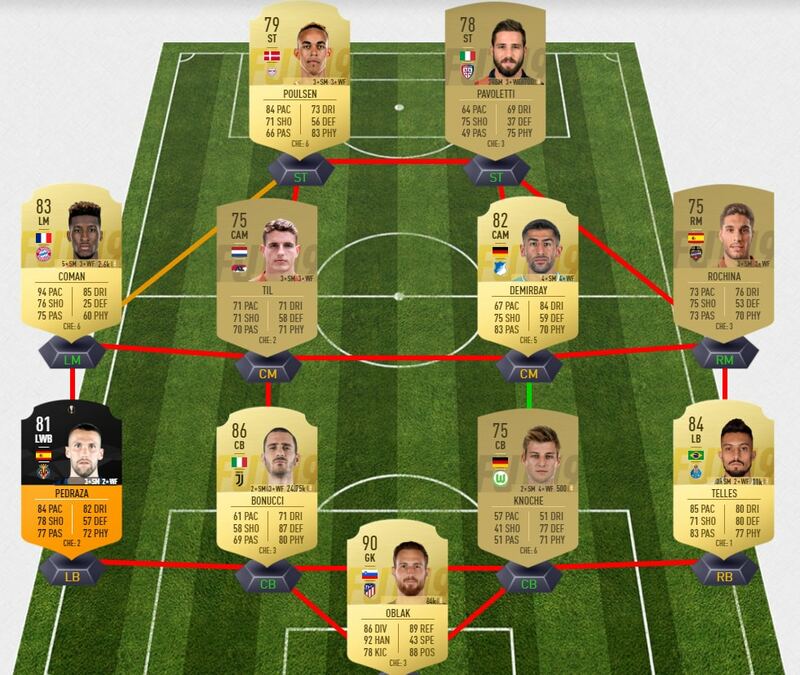 Predicting the Team of the Week is one of the most interesting things about FIFA 19 Ultimate Team. Although EA Sports chooses the best 11 according to results from real life, sometimes it’s hard to understand their choices. That’s why predicting Team of the Week 23 is challenging and engaging. All FIFA 19 and football fans would claim that it’s easy to be Atletico’s Madrid goalkeeper. You have an impenetrable defense in front of you such as Atletico’s defense. They stop almost all shots directed towards Jan Oblak. However, Jan Oblak was pretty busy in the last match, trying to save Atletico’s goals. He saved six scoring attempts, and as a result, Atletico defeated Rayo Vallecano without conceding a single goal. A Team of the Week 23 would be the first TOTW that Oblak is part of. Such a great goalkeeper; he absolutely deserves to get his TOTW card. If you are looking for a good, offensive Left Wing-Back, Pedraza is a good budget option. He doesn’t cost so much, and he gives you so much of attacking resources on the left side. He doesn’t have the best defensive abilities, and that’s why he is more left-midfielder than left-back. Pedraza helped Villareal to beat Sevilla 3-0 by scoring one goal. Also, he was a constant threat to the opponent’s right side. Pedraza missed one big chance and had a couple of key passes. Considering his good form, and that he still hasn’t been part of TOTW, EA should think about putting Pedraza in Team of the Week 23. Bonucci is top class center-back, and it’s so unbelievable that he still hasn’t made it to TOTW. 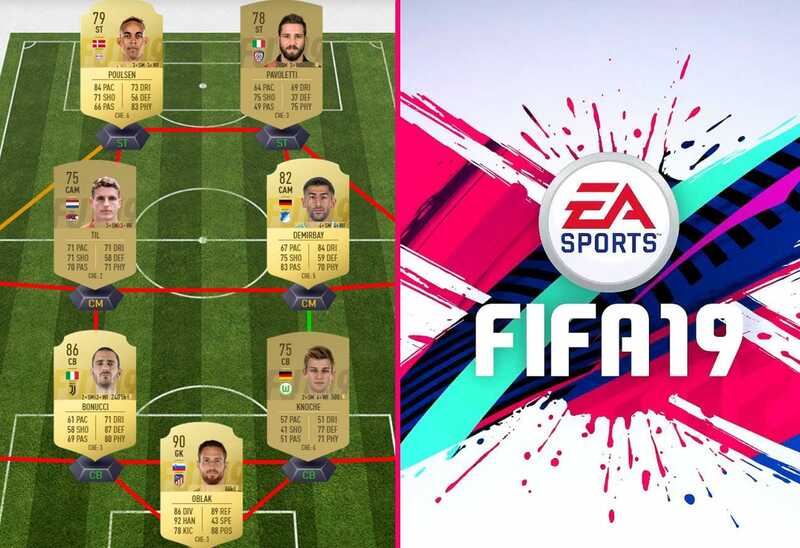 However, this is a perfect opportunity for EA to place Bonucci in Team of the Week 23. The Italian defender helped Juventus to keep a clean sheet against Frosinone. He had five clearances and blocked one shot. In addition to that, he scored in the 17th minute to double Juventus’ lead. There is no good reason to not put Bonucci in Team of the Week 23. Although there is already one Left-Back, EA Sports proved so many times they don’t care about formation when it comes to TOTW. Therefore, there is enough space for Porto’s Left-Back in Team of the Week 23. Telles was Man of the Match against Vitória Setúbal. His team won with 2-0, and Telles provided his team with one assist. Also, he had some amazing stats. Telles stole three balls and won five duels. In addition to that, he had four key passes. Vitória’s defenders really had a problem to tame Telles. In FIFA 19, Telles has phenomenal skills for one Left-Back. His Stamina, Pace, Crossing, Curve, and Long Passing skills make him incredible Left-Back, perfect for your Portugal team. But he is expensive, given that his standard card costs about 11k coins. Currently, Knoche is not one of the cards you’d like to have on your team. He is slow and has pretty bad shooting, passing, and dribbling skills. Nevertheless, if he makes it to Team of the Week 23, maybe he will become good enough for anyone’s team. He was a real monster against Mainz. Knoche helped his team to win 3-0 with a goal and incredible defensive performance. He had 12 clearances, 7 duels won, and one stolen ball. This young Dutch played a very good game against VVV-Venlo. He scored one goal and had three key passes. In addition to that, Til created one big chance for his teammate. Currently, Til is nothing special, but his In-Form card would be valuable enough for your Dutch team. Demirbay got pretty high ratings after Hoffenheim’s win versus Hannover 96, but he absolutely deserved it. German player had a big impact on Hoffenheim’s game with one goal and assist, and another four attempts. Demirbay had three key passes, and 86.1 % of successful passes. He is exactly the same in the game with good Vision, Short Passing and Curve abilities. He already was part of TOTW once, so this would be his second Team of the Week. At the moment, Rochina is just average FIFA 19 winger with good Shooting skills. However, after he assisted his teammates twice for the 4-1 triumph over Celta Vigo, he will maybe get a much better card. That would be his debut in Team of the Week. Rochina also created four big chances and won six duels. The competition is tough, but he definitely deserves to be taken under consideration for Team of the Week 23. Bayern Münich had a pretty close match against Augsburg. The final result was 3-2 in Bayern’s favor, and young Coman took a part in all goals. He scored twice to equalize the score and assisted David Alaba to set final result. Interestingly, this young Frenchman still wasn’t part of TOTW, and this is the perfect situation for him to make debut this season. It would be a real surprise to not see Coman in Team of the Week 23. This powerful striker had a chance to be in TOTW twice this season. If he makes it to Team of the Week 23, it will be his third time. RB Leipzig beat VfB Stuttgart 3-1, and Poulsen scored two goals. Poulsen’s standard card is primarily based on good physical skills including Pace, Stamina, Aggression, and Jumping. His In-form cards were improved drastically in other aspects of the game as well. Having a fast and powerful striker sometimes can be everything you need in FIFA 19. Pavoletti was the real hero in Cagliari’s victory against Parma. Cagliari won 2-1, and Pavoletti scored both goals. First, he equalized the result in the 65th minute, and then 20 minutes later, he scored another one for triumph. At this moment, Pavoletti has typical Italian striker card, with incredible heading (91). But alongside good shooting skills as well as Jumping and Strenght, he doesn’t have so good stats. But Team of the Week 23 card would bring him much better stats.